Winners in each category will not only get a share of prize pot worth £100,000, but they'll also receive expert training from Google's digital taskforce for shops, bars and restaurants and a trip to Twitter UK's London office to boost their social media skills. Between now and 18 November you can cast your vote for free via thegreatbritishhighstreet.co.uk. "Our high streets are the life and soul of towns, villages and cities across the country and the record number of competition entries this year is proof of their continued importance to local life. There are bustling high streets up and down the country from North London to Northumberland and now is the time you can show support for your local area and get voting." The Great British High Street Competition 2016 celebrates the great work that is being done to revive, adapt and diversify the nation's high streets. 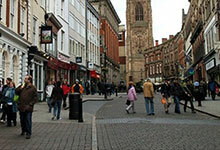 It is one of a number of initiatives to help champion high streets as the cornerstones of the community. The government is helping local business communities adapt to the changing face of high streets, with a £6.7 billion package of business rates support, to cut the rates for 900,000 businesses - with 600,000 now paying none at all. This year's competition saw a record 900 entries across all 14 categories, including the new categories for individuals and shops. The second Great British High Street competition last year saw 230 entries and attracted over 200,000 public votes, with Bishy Road in York, a former finalist, crowned Britain's best. Bishy Road found that winning not only boosted town pride, but also had a tangible economic impact with retailers reporting increased footfall. Alongside the public's votes shortlisted areas will also be inspected by judges made up of industry leaders from across retail, property and business - including British Land, the Post Office and Holland & Barrett. Voting closes on 18 November 2016.